Finally Microsoft is relasing a Windows 8 tablet PC called Microsoft Surface tablet for the mobile users. Microsoft is providing Microsoft Surface tablet PC for Windows 8 users which will experience both touch features of a tablet PC and capability of doing office work using a keyboard with type features. Windows 8 users can fully benefit from touch features of a tablet PC on Microsoft Surface tablet, besides they can use their Surface Tablet for doing office work by just attaching a keyboard easily. Microsoft Surface tablet PC promise Windows users the endless world of Windows 8 apps, entertainment and the power of Office. I believe, it is nice to see increasing number of Microsoft tablet PC's running Windows 7 and/or Windows 8 in the market. Besides its all other features, design features of Microsoft Surface are unique and will make any tablet PC user love Surface by Microsoft. Microsoft is planning to release two different Windows 8 tablet PC versions. One of them which is for more light use of Surface tablet will run new operating system so called Windows RT based Windows 8. Other Microsoft Surface tablet will run Windows 8 Pro operating system. Although the Windows 8 tablet versions of Microsoft Surface are not yet clear, the weight of the Windows 8 Professional version is about 900 grams. This is slightly lighter than the Samsung Slate tablet which can also run Windows 8 operating system with its Intel i5 processor. The Microsoft Surface tablet Pro version has Intel Core i5 processor. There're such similarities between Microsoft Surface tablet and Samsung Series 7 Slate tablet PC. Windows 8 users can fully use the multi-touch features of Windows 8 on Surface tablet PC. But if they require to write or edit long text, or they need to interact with their software other than touch, they can connect a keyboard that comes with Microsoft Surface, and type or edit using keyboard. Microsoft Surface planned to have 10.6 inch monitor for 16:9 widescreen full HD Display for maximazing the entertainment from your new Windows 8 tablet. Surface tablet owners will love to watch full HD movies on their tablet where Microsoft ClearType HD Display technology will perform the best image quality. One note for HD display support of Microsoft Surface tablet, it is planned to support full HD display only on Windows 8 Pro version. Surface running Windows RT will support HD display at first. Using mobile devices especially tablets are problem when sunlight is powerful. It is good that Microsoft Surface is designed to adjust the screen intensity automatically, so that Surface tablet users can continue using their computers indoor or outdoor on any light condition without a significant problem. One more feature of the Surface monitor is its wide viewing angle which enables a clear display for many viewing angles. Let's check what comes with Microsoft Surface when you buy one of these excellent Windows 8 tablets. First the Surface tablet is protected by VaporMg case which very strong still very light for carrying your Surface tablet with you. The VaporMg case includes a build-in stand which enables tablet users immediately and easily open the stand and put your tablet on a table and watch a movie or a video from where you sit. Tablet users can open the build-in stand with one touch and start typing using one of the Touch Cover or Type Cover named keyboards. In fact Touch Cover and Type Cover are not only keyboards for typing easily, they are actually the covers of your tablet. They are very thin still very powerful for a cover. This makes especially the Touch Cover excellent which is slightly thinner than Type Cover. 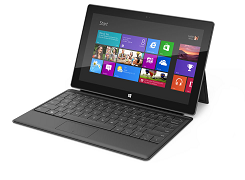 Touch Cover or Type Cover of your Microsoft Surface PC is a seperate component from the tablet. But by the use of magnatic clips, Surface tablet and Touch Cover or Type Cover perfectly sticks to each other. This makes you feel not worried while carrying your tablet and cover in your hands.